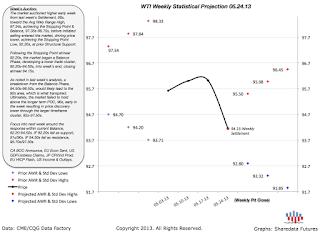 Our weekly TPO Profile graphics for 24May. Plotted are Structural Support (blue), Resistance (red), and Points of Control (green). lower should a sell response develop at the overhead supply. 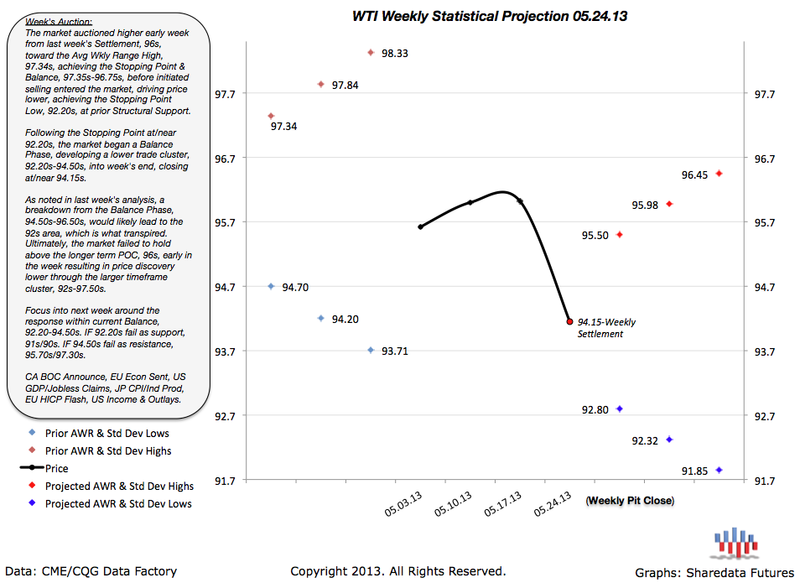 Our weekly statistical study plotting the key reference levels/weekly close for 24May, projected levels and inferential analysis for week ending 31May. 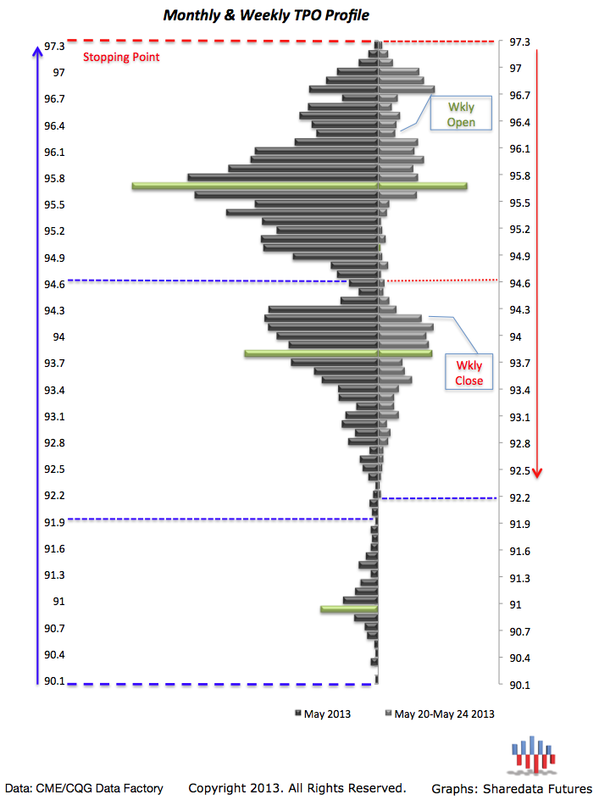 The market auctioned higher early week from last week’s Settlement, 94.15s, as initiated buying drove price out of last week’s trade cluster, 92.20s -94.50s, into the low usage area overhead. The market achieved the Stopping Point High, 95.90s, at/near the Weekly 1st Std Dev High & Key Overhead POC. Following the Stopping Point & Balance at the high, initiated selling entered, driving price lower through midweek, achieving the Stopping Point, 91.60s, at/near the Weekly 2nd Std Dev Low. The market balanced, 91.60s-94s, selling off into Friday’s close at/near 91.95s. 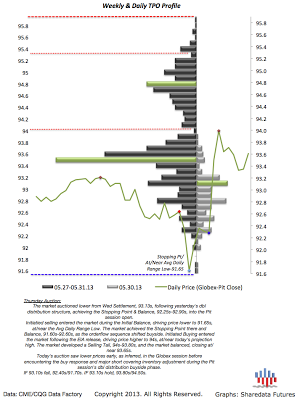 Ultimately, this week’s auction first filled in last week’s low usage overhead with a buyside auction to key overhead supply, where the market encountered the sellside, driving the market lower, continuing the development of the larger timeframe Balance, 90s-97.20s. 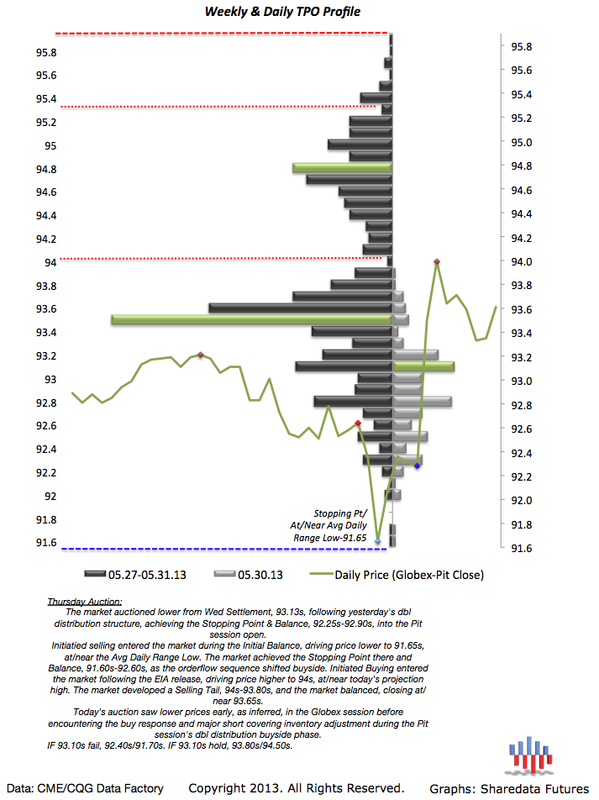 These studies helped inform our subscribers of the Structural significance of the breakout of last week’s lower trade cluster, 92.20s-94.50s, and the potential Structural and Statistical destinations in either case (early week asymmetric risk to sellside). Additionally, this data identified the asymmetric risk developing for the buyside into Key Structural Supply overhead into midweek. Finally, Structural and Statistical Support/Resistance provided quantifiable, potential destinations in congruence with market structure. Holistic analysis based on the market generated data and probability logic. 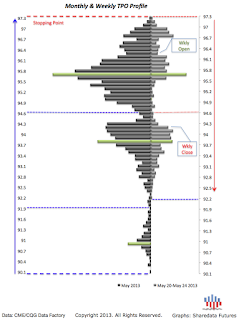 the market balanced around Thu Settlement, 93.61, into the London session where sell programs entered the market, driving price lower,achieving the Stopping Point, 92.70s, and Balance, 92.70s-93.30s. 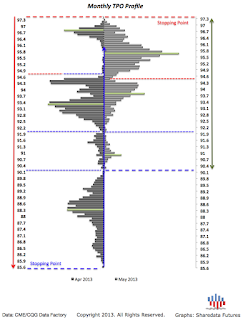 The market is filling in the low usage area, 93.10s-92.60s, created by yesterday’s dbl distribution structure. Response within the Balance and low usage area will be of focus into the Pit session.